An analysis of Strengths, Weaknesses, Opportunities, and Threats is a standard tool for managers of companies large and small. But does the order of the analysis matter? When I earned my MBA, some years back, the analysis was SWOT, starting with and internal assessment of the Strengths and Weaknesses of the organization. 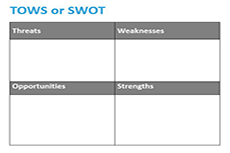 A SWOT matrix was required of most case studies in our curriculum. As a member of the leadership team of various small technology companies, I had the opportunity to share the brainstorming technique with colleagues and bosses. It works. By taking the time to think strategically about the business, a new product, or marketing approach, the team can tease out potential threats, more easily identify the strengths and leverage those. But recently, I had the opportunity to observe a group of mid-level managers engaged in a TOWS analysis. That is they focused first on the emerging Threats and Opportunities in the external environment affecting the business. This leads to more focused and specific conversations rather than and internal focus, which is more subjective. You see, in management, as in life, your perspective matters. The next time you lead your team through an environmental analysis, try starting with Threats and Opportunities and see what happens.